When Ella Fitzgerald danced the Lindy Hop on the streets of 1930s Yonkers, passersby said good-bye to their loose change. But for a girl who was orphaned and hungry, with raggedy clothes and often no place to spend the night, small change was not enough. One amateur night at Harlem’s Apollo Theater, Ella made a discovery: the dancing beat in her feet could travel up and out of her mouth in a powerful song – and the feeling of being listened to was like a salve to her heart. 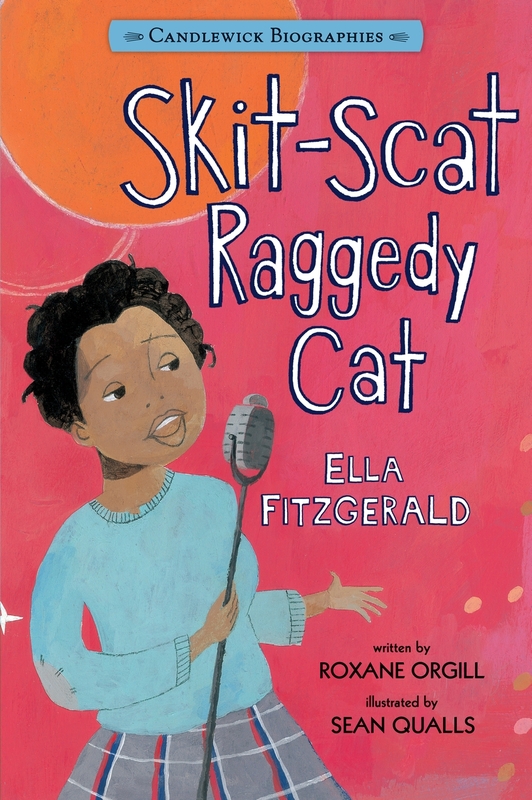 With lively prose, Roxane Orgill follows the gutsy Ella from school-girl days to a featured spot with Chick Webb’s band and all the way to her number-one radio hit “A-Tisket, A-Tasket.” Jazzy mixed-media art by illustrator Sean Qualls brings the singer’s indomitable spirit to life. Roxane Orgill is an award-winning writer on music and the author of several biographies for young readers, including Mahalia: A Life in Gospel Music and Footwork: The Story of Fred and Adele Astaire.She is also the author of Dream Lucky, a book for adults about big-band jazz, race, and politics in the 1930s. She lives in New York City.